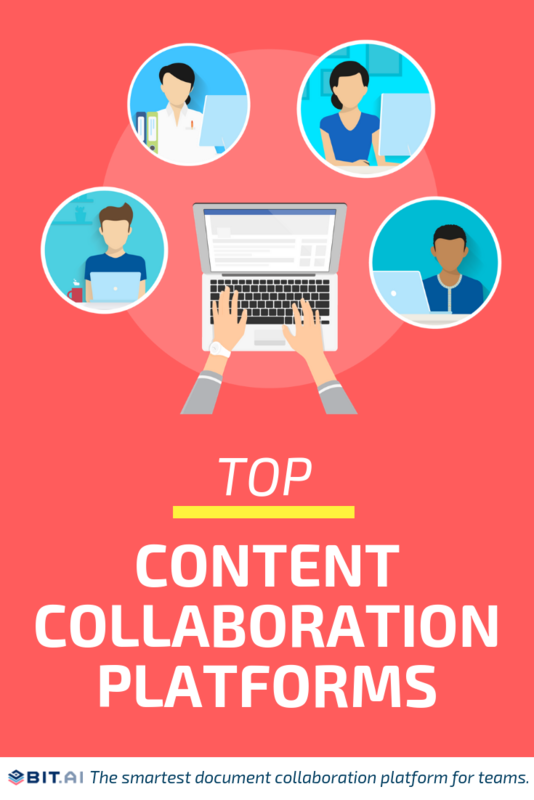 Let’s take a look at some of the best content collaboration platforms out in the market today! We all produce and share a plethora of content every day. Every day 2.5 quintillion bytes of data are created! (Soure: Forbes.com). Thanks to our businesses becoming more digitally inclined, we are constantly sharing our files- documents PDFs, sales decks, project proposals, training material, HR guidelines, etc. with our co-workers via email, Slack, internal wikis, cloud storage services, etc. Apart from sharing work-related content, businesses are regularly creating marketing and sales collateral like social media images, company logos, videos, blog posts and articles, podcasts, infographics, etc. to please the ever-increasing hunger for new content on social media. However, all of this massive amounts of content being shared on a daily basis creates a big problem for businesses. Even though creating and sharing content is an integral part of any business, the problem arises when you have to store this content or worse, find it. According to a McKinsey report, employees spend 1.8 hours every day—9.3 hours per week, on average—searching and gathering information! Shocking, right? Think about it- your content is often scattered all over the place on your digital devices. You may have files stored in cloud apps like Dropbox, Google Drive, OneDrive, Box, files stored on your desktop, email attachments, and so on. With our content present at multiple places, how do you plan on locating, accessing, and sharing it quickly and getting work done on time? We have all been there- searching for that important file in your massively populated inbox, browsing through hundreds of folders, searching through your cloud apps, or your laptop’s downloads folder is no fun. Employees often can’t find the right content at the right time or can’t access the content due to time or location barrier. All of this add ups to a big loss of time and productivity. If you too are struggling with similar issues, a content collaboration platform is the thing you need! A content collaboration system helps organizations keep all of your content, media files, and documents in one place for easy storage and retrieval. No more hunting down email, browsing through folders, and worse, no more shoulder tapping! Sounds good enough? So let’s take a look at some of the best content collaboration platforms out there and see which one would be perfect for your team! 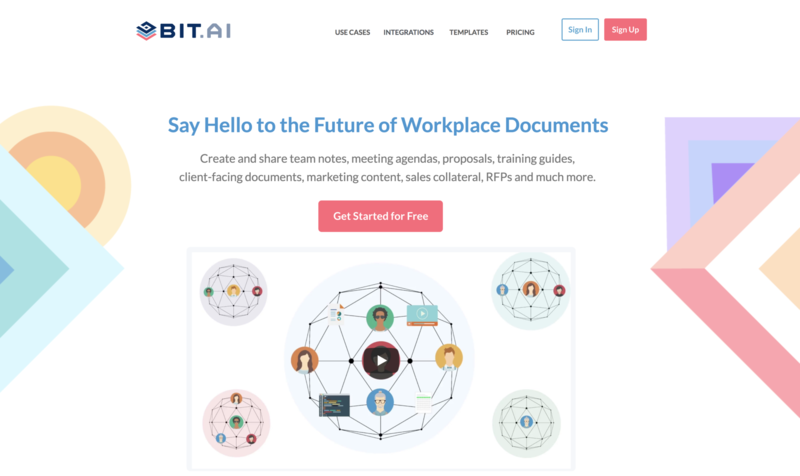 Bit is a new age cloud-based document collaboration and content collaboration platform. Bit helps teams collaborate on interactive documents, store digital assets and track their documents. Bit’s interactive documents allow teams to work collaboratively in one place where they can bring in various types of digital content inside the document. Digital assets like PDF, cloud files, videos, audios, spreadsheets, etc. can be added inside of these interactive documents. As teams work together their information is stored inside of workspaces, making it easy for teams to not worry about sharing permissions and have access to all the information they need. Bit has a central content hub known as the content library. It is a smart way to save your digital content in one central location. Bit is reimagining digital content storage by allowing you to add any type of content from anywhere. Now you can bring together files, images, rich embeds and weblinks into one central repository. Google Drive is Google’s cloud storage service where you can store your documents, files, audio, videos- basically anything. You can access your files stored in Google Drive from anywhere and from any device, as long as you know the login details! Google Drive offers free 15GB of cloud storage to store all your documents, spreadsheets, and media files but you can always upgrade in case you need more. Google Drive also provides you with various control options over who can view, comment and edit your files. You can share your files with anyone who has an access link to it. If you want to co-edit a Google file your collaborators must have a Google account. Dropbox offers cloud storage to keep all your files in one place. It also offers desktop clients and mobile apps to keep all your files in sync and within reach. Dropbox offers free synchronization between desktop, cloud, and mobile. With Dropbox, you can instantly send files or folders to those inside or outside of your organization with shared links. You can also gather feedback on the files you share and invite your team to edit files together. Dropbox allows integrations with over 100,000 third-party apps, making it a cloud storage workhorse. The free account starts out with a 2GB storage capacity which is way lower than what Google Drive or other services offer. Atlassian Confluence is a content collaboration platform that allows your team to create, store and share documents from one dashboard. Confluence allows users to easily publish, organize, and access company information in one central location so you can help your customers help themselves. 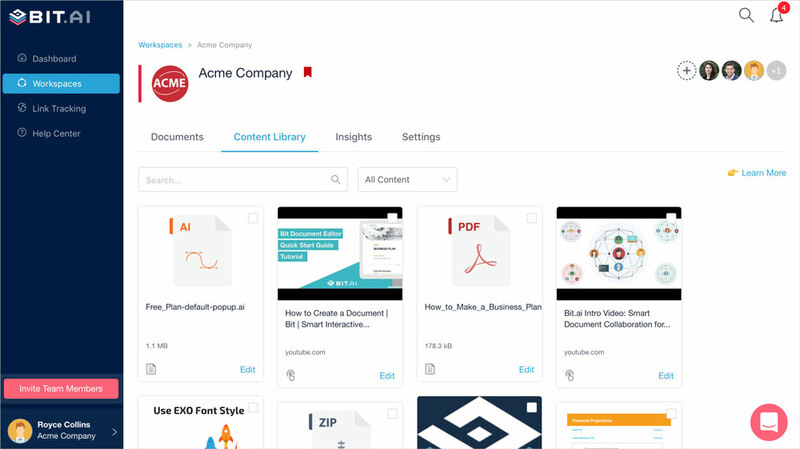 Team members can store content such as PDFs, docs, images, track every version and changes made to a page, and connect to Jira to provide insight into their development work with automatic linking, quick issue creation, and reports. Team members can also leave feedback on documents with inline, file and page comments, without getting lost in your email threads or chat messages. If your team already uses Jira and HipChat by Atlassian, Confluence can turn put to be a good add-on. Another worthy content collaboration platform is BoostHQ, which allows organizations to create, share, and centralize internal knowledge and content. BoostHQ helps employees organize company knowledge by groups, categories, and tags, which makes the process of information search and retrieval quick and easy. Features like “employee discussions” allow employees to share their thoughts and experiences, capturing and retaining their knowledge for future reference. Employees can share various types of content like PDF, text, images, or videos into different groups and make it accessible to their peers. Robust analytics gives you intelligent insights into what’s the most popular content in the organization and who’s the most active members. Using BoostHQ’s Chrome Extensions, employees can easily share links and videos, right from their browser on any device. Box is a cloud service specially designed for businesses and the IT sector to share, edit and secure files over the cloud. Box allows seamlessly transfer of data from your PC to Box cloud. You can invite teammates to collaborate, join in on any conversation, or edit files together for better results and understanding. You can control who can view, share, edit and upload files, giving you a lot of security and privacy options and send large files quickly over the cloud. Box recently introduced Box notes, a collaborative note taking app free for Box users. Notes let you collaboratively edit notes with your team, with basic formatting tools and the ability to add comments. Alfresco is an Enterprise Content Management Tool aimed to make your workflow smooth and streamlined. Its core offering, a Digital Business Platform lets IT develop modern solutions for efficient workflow. Alfresco provides all the necessary features for creating, editing and storing documents. Features like version-control allow you to access and view the most recent and previous versions of a document. Users can either store their files and documents in the system or in Alfresco cloud. Teams can collaborate and communicate effectively with features like project wikis, task lists, and activity feeds. Alfresco’s mobile apps available for both Android and iOS allows users to view and share documents on the fly, making it truly flexible and accessible. M-Files aim to change the way the world access information. As a professional, you have various forms of data residing in numerous desktop and cloud applications. You can have your client data in Salesforce or a word document in Goole Drive or Dropbox, or other company assets like jpegs, videos, PDFs, presentations etc all reside on different platforms. This makes it extremely difficult to find that one piece of information when you need it the most. M-Files solves that problem by virtually creating a single access point for all your data online. You can just tag the file, fill in the metadata and hit save. M-files will be able to easily locate it and let you know whenever there is duplication. M-Files claims to provide enterprise-level security and keeps your data safe. Bitrix24 acts as a “social intranet” for your company. It takes inspiration from the social networking style of communication and allows users to make social profiles, add their information and images, instant message one another, share content, like updates and activities, comment on posts, and collaborate and communicate with each other using the activity stream. Bitrix24 provides tools for content collaboration, task management, document sharing, project management, CRM, email automation, workflow management, lead capture, and time tracking integrated into a social interface for maximum efficiency. There are also mobile apps available to use Bitrix24 anytime, anywhere. Filled up to the brim with everything a business needs to get work done, Bitrix24 can sometimes turn out to be overwhelming. If you need a more streamlined tool to focus only on managing documents and organizational information, without the plethora of features, you might wanna look elsewhere. So there you have it, a list of some of the best content collaboration platforms on the market today. The goal of a content collaboration platform is to bring together an organizations’ useful yet fragmented pieces of content together and make it available to all the employees of an organization in a systematic manner. According to Gartner, “By 2020, 80 percent of large and midsize organizations in mature regions will have deployed one or more content collaboration platform (CCP) products to implement a content productivity and collaboration strategy. Don’t lag behind and start deploying a content collaboration platform today!